During my time here on earth I've come to a conclusion that most problems are caused by misunderstandings and assumptions. People of all ages, cultures and genders are dizzyingly fast to jump into conclusions, classify and categorise people and make judgements that are hit and miss. Sometimes those assumptions are close to truth, sometimes they are as far as they can land. Tarot is an incredibly useful tool for clearing out any assumptions and understanding the other person's view. However, this is a difficult area for a reader because it requires a) staying 100% objective and calm, no matter what comes up, b) being willing to explore and change one's own view about others, the situation and oneself, and c) ability to take on board feedback, constructively, even when it hurts. A couple of weeks ago, I asked one card for "what's the main energy in my life right now" just to check what's coming on my way. I got the Tower: destruction of beliefs, shock to the system. I was highly sceptical about this card, because nothing in my life was even close to a shock - I couldn't see where it could come from. The clarifying cards told me it relates to a certain relative, so I expected to get some mildly concerning news, such as the person having lost their job. I also got clarifiers telling me to stay calm and understand that this is a learning opportunity, not the end of the world. In particular, I should not behave like the Queen of Wands reversed: defend myself with fiery passion and attack the other person with hysteric blows (which I sometimes do, thanks tarot for revealing it to everyone). Well, what do you know: on the same night, the Tower turned out to predict a full-blown fight with this particular relative, based on a bundle of accumulated misunderstandings and wildly exaggerated assumptions from the past three years. The person had been penting them up and blew them up now, triggered by ongoing major changes in their own life. A number of decisions and actions I had taken during the past three years had got a completely tainted, skewed colour in this person's head, based on their own fears and disappointments in life. After the Tower situation, I did readings to ask: what's really going on, what does this person feel about me and why, what do I feel about them and why and what should I do. I learned that the person's view was based on immature thinking and lack of life experience due to younger age, I had caused a big unintended change in their life in a roundabout way by showing that life can't be an eternal, hedonistic party but it's quite a bit about responsibilities and planning ahead. Cards showed that this situation was a development chance for all of the people involved. I was prompted to keep my cool, not get emotional nor defensive, and stay detached - it wasn't about me, even though I had been the trigger. It was about the others involved to explore their emotions, assumptions and beliefs. I think one of the most consuming thoughts people have is: "what does so and so think of me? ", be it a lover, love interest, prospective employer or an "enemy" (someone we don't get along with or have had a falling out with). The truth is, all of us only have a limited chance to affect this. If people like us, they'll like us even after blunders, arguments or misunderstandings. If they decidedly don't like us, they won't love us even after a number of good will gestures, exaggerated friendliness, or all the good deeds in the world. If they are mature enough, they might grow more affectionate by time - but until that, each one of us can just keep living our lives, not try to please or impress. In particular with spiteful or negative people we can only try to understand what they feel and why, and of course clear any misunderstandings, but there's absolutely no point in trying to bend over backwards to change their view. It's a huge energy drain and waste of time. It's better to be yourself and find the people who appreciate you for who you really are, than try to please everyone (or not offend anyone) and become a diluted version or a shadow of yourself. This, however, doesn't mean that anyone can behave in any way they please and mask it under "this is who I am, take it or leave it". Being oneself doesn't mean: be a jerk. My point in a nutshell is: whatever someone else thinks of you, is always coloured by their own perception, it's not the truth about who you are and shouldn't cause you sleepless nights. What am I to X? What is X to me? What would I like X to be? What is X learning from this? What should I do/what action to take with X? What should I remember when dealing with X? Be as objective as you can, try to detach from any personal wants or dislikes. Keep healthy boundaries: be polite and willing to try to cooperate, but not more. It needs to be an equal effort to get along, not up to one person to please at any cost. Best of luck! Sometimes the words that pierce our heart carry wisdom which needs to be taken on board. But sometimes - maybe more often - they are born from misunderstandings, negativity or spitefulness and should be ignored. There's no point in bleeding for someone's skewed perception. 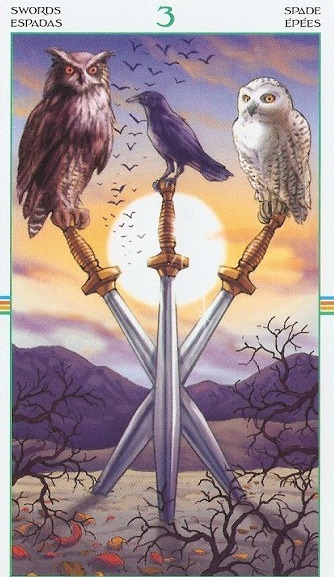 3 Swords by Antonella Platano & Maria Carati, Wheel of the Year Tarot. Hi Ray, I agree with you, it IS super difficult! Reading for oneself and about topics that matter a lot emotionally is one of the most difficult things to do. After all, tarot in general requires calm and clear mindset to be able to see the message without any bias, and it's next to impossible to do if you're in emotional turmoil. I've been there too and only got negative or meaningless cards. I think it's because either the cards pick the energy of you and reflect it instead of the real answer (your worries, fears and anxieties, or alternatively, your deepest hopes); or, it's just difficult to interpret the message when you are so very worried about seeing a certain message or hoping intensely to see another one. Even though I read professionally, I go to other readers for topics that are emotionally difficult for me. I think the options are to wait, calm down and only read when you're not as agitated anymore (even if it takes weeks), or ask someone reliable to read for you.